Sage Systems, Inc. nomous Local Area Distributed Network) is data networking technology for energy management and appliance control. It is designed to connect everyday products to each other and to the Internet. With this technology, products interact automatically with each other and the outside world over the existing electrical wires. Through a standard web browser, users can graphically view the status of their networks, remotely control and program devices, and gather valuable data on the usage of those devices. Aladn-enabled meters, thermostats, light switches, and electric outlets monitor and report energy consumption and usage patterns and status and health of other devices to maximize energy savings, comfort, and security. These products require no new infrastructure; they operate over existing electrical wiring and can be installed in minutes. 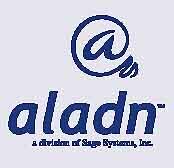 An Aladn Gateway provides the connection between devices and the outside world. The Gateway links the local area network to the Internet and Sage server software via IP, POTS or other connections. The Gateways can stand-alone or be easily embedded in DSL and cable modems, automatic meters, and other devices. It accommodates existing "dumb" devices as well as future "smart" ones. The energy and consumption data received through the technology can be exported to most data formats and is easily integrated into existing systems and applications.